TVSS (Transient Voltage Surge Suppressor) and SPD (Surge Protective Device), both refer to the device that can protect the low-voltage electrical system from damages of transients, spikes or surges (indirect lightning strike induced from power lines). The term TVSS is more popular in UL standard countries like United States, Canada and some countries in Middle and South America or even Philippines. TVSS vs TVS, are they the same? Note that do not mix the term TVSS with TVS. TVS is abbreviation for transient voltage suppressor. From their name, they seems like the same thing. Yet in surge protection industry, TVS is an electrical component (a diode) that serves the purpose of surge suppression. It is one the top 3 most common surge protection components (the other 2 is MOV and GDT ). Like MOV and GDT, TVS can be used to make TVSS and in fact it is normally used togeter with MOV and GDT. GDT can handle very large lightning and surge current yet it responds quite slow while TVS can only handle a very small surge current yet it responds way much faster than GDT and MOV and thus the 3 form an perfect coordination in surge suppression. Why do SPD manufacturers no longer describe their products as TVSS? TVSS devices have always belonged to a larger family of surge suppression devices known as SPDs (Surge Protective Devices). Beginning with UL 1449 3rd Edition and the 2008 National Electrical Code, the term “SPD” has formally replaced the terms “TVSS” (Transient Voltage Surge Suppressor) and “Secondary Surge Arrester”. SPDs are now classified as Type 1, Type 2, Type 3 or Type 4 and are selected based on application and the location where they are to be used. With the recent changes in terminology by UL and the NEC, there are no longer any standards organizations that use the term TVSS, as IEEE®, IEC® and NEMA™ have been using the term “SPD” for many years. This is a simple version of the evolution of TVSS to SPD. Yet technically, TVSS and SPD is not interchangeable. A formerlly known TVSS is now a type 2 SPD as in the old version UL standard, TVSS is installed at the load side of the service entrance. Yet SPD can be installed eithered at the load side or the line side. However, for general consumers, you are take TVSS and SPD as the same thing and neglect the technical minor difference. TVSS is Surge Suppressor or Surge Protector in the form of power strip? Well, there are a lot of power strip or receptacle with surge protection function on the market. Normally we call these type of products surge suppressor or surge protector and one of their major parameter is the joules rating. Yet these surge suppressors or surge protectors in the form of power strip don’t equal to TVSS. You can think of TVSS as a big product family and surge suppressor or surge protector are only part of it. Technically, we call these surge suppressor or surge protector type 3 TVSS or point-of-use TVSS as they normally installed aside by the protected equipment and serve as the last defence for surge protection. Type 1 or type 2 TVSS is normally in the form of a box or panel, sometimes can be quite large. Its major parameter is not Joules rating but surge capacity. Type 1/2/3 TVSS forms a coordinated 3 layers surge protection mechanism. How does TVSS (transient voltage surge suppressor) work? The terms surge protection device (SPD) and transient voltage surge suppressor (TVSS) are used to describe electrical devices typically installed in power distribution panels, process control systems, communications systems, and other heavy-duty industrial systems, for the purpose of protecting against electrical surges and spikes, including those caused by lightning. Scaled-down versions of these devices are sometimes installed in residential service entrance electrical panels, to protect equipment in a household from similar hazards. What does transient stand for in the term transient voltage surge suppressor? If you look up the dictionary, transient means last for a short period of time. Or if you look up the Wikipedia, it will tell you: A transient event is a short-lived burst of energy in a system caused by a sudden change of state. Yet in surge suppression field, how short is a transient? If the overvoltage last for, for example, 5 seconds, is it a transient? Definitely not. In surge suppression, transient surge happen in microsecond (1/1000 second) or even millisecond (1/1000000 second). So now you realize that how fast can a surge be. And that brings up another topic: what is a overvoltage last for longer than an transient and how will a surge suppressor (or a surge protection device) respond to this situation? That overvoltage is what we call temporary overvoltage (TOV). Temporary overvoltage is not something a surge suppressor can handle. Actually, surge suppressor is the victim of temporary overvoltage. Surge, as strong as it may, only last for microseconds or milliseconds and thus it only transfer a limited amount of energy to the surge suppressor. Yet TOV, as its during is much longer, it actually brings a destructive impact on the surge suppressors which are normally based on metal oxide varistor (MOV) and thus the MOV inside the surge suppressor is heat up and eventually get smoke and catch fire. Therefore, a stable power grid is crucial for any electrical product including surge suppressor. OK, you maybe wonder: I live in a area where the power grid is a mess. In this case, TVSS is not applicable? The European surge suppression manufacturers has offered us a very good example. About 20 years ago, the European surge suppressor manufacturers started to export surge protection device to China yet a lot of these SPDs, which work perfectly well in Europe, are burnt in applications. One of the major reason is that Europe has a very stable power grid and thus the SPD manufacturers launch the surge suppressors with Uc/MCOV (continuous voltage / maximum continuous over voltage) at about 255V. Yet 20 years ago in China, the power grid is far from perfect and the voltage fluctuation is frequent. The problem is solved after the SPD manufacturers adopted an higher Uc/MCOV. Thus, as long as you choose a TVSS with a higher Uc/MCOV, it is OK to use TVSS in voltage fluctuated areas. For example, when we export our surge suppressor to India, we normally adopt Uc/MCOV at 320V or 385V. What does it mean by type 1/2/3 TVSS? In UL 1449 standard, the type of a TVSS is mainly determined by its installation location. Type 1 TVSS, although mainly installed at the line side of the service entrance, is applicable at anywhere within the power distribution system. 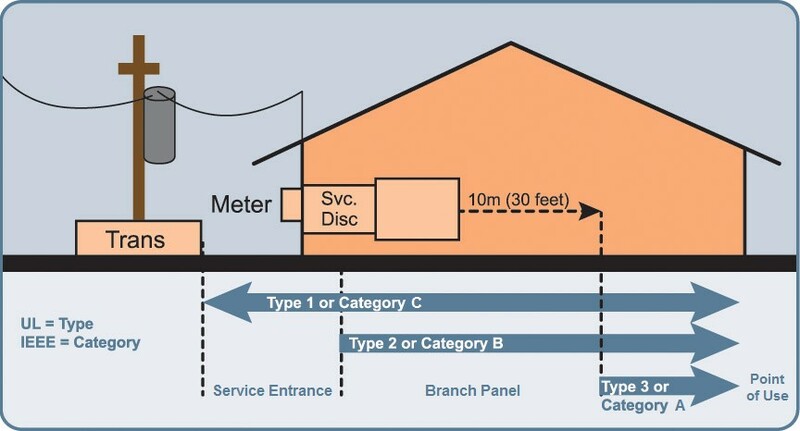 Type 2 TVSS is installed at the load side of the service entrance (that is, the branch panel) while type 3 TVSS (normally power strips, receptacles or plugs) is installed near the protected equipments. Here is an illustration of the types of TVSS based on installtion locations. Here are some pictures of type 1/2/3 transient voltage surge suppressor (TVSS) in UL standard. Type 2 TVSS may require external overcurrent protection (CB or Fuse) or it may be included within the TVSS. Type 1 TVSS generally include overcurrent protection within the SPD or other means to satisfy the requirements of the standard; thus, Type 1 SPDs and Type 2 SPDs that do not require external overcurrent protection devices eliminate the potential for installing an incorrectly rated (mismatched) overcurrent protection device with the SPD. Nominal Discharge Current (In) ratings of Type 1 TVSS can be 10 kA or 20 kA; whereas, Type 2 TVSS may have 3kA , 5 kA, 10 kA or 20 kA Nominal Discharge Current ratings. But for non-professionals, it is sufficient to distinguish these types by locations. Here we have a introducing video presented by Jeff Cox that may give you a better understanding.